Tuesday December 17th 1901 Still very cold bsy with the work a great part of the day. I knit in the afternoon and evening. Will out most of the day busy with the stock. Will Hedges fixed the well after dinner. 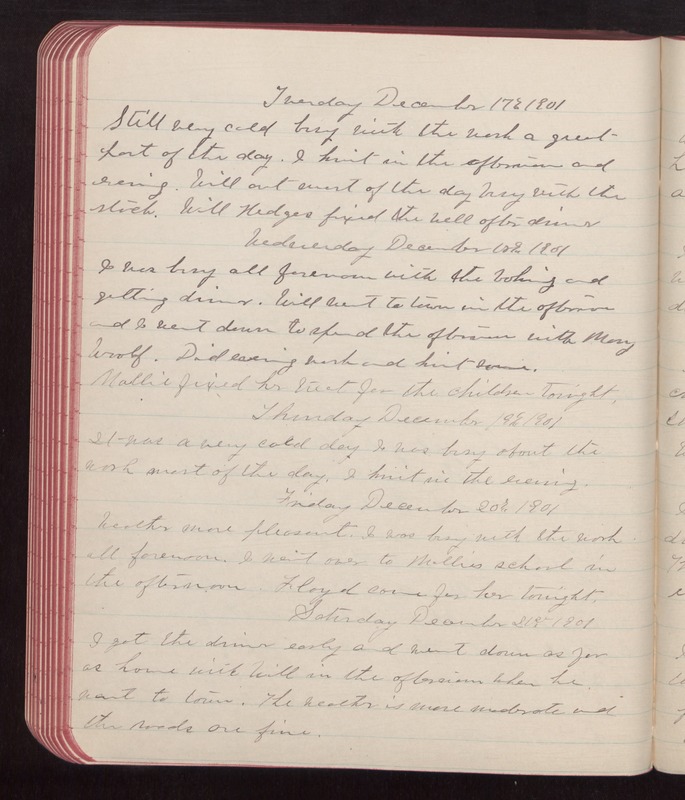 Wednesday December 18th 1901 I was busy all the forenoon with the baking and getting dinner. Will went to town in the afternoon and I went down to spend the afternoon with Mary Woolf. Did evening work and knit some. Mollie fixed her treat for the children tonight. Thursday December 19th 1901 It was a very cold day. I was busy about the work most of the day. I knit in the evening. Friday December 20th 1901 weather more pleasant. I was busy with the work all forenoon. I went over to Mollie's school in the afternoon. Floyd came for her tonight. Saturday December 21st 1901 I got the dinner ready early and went down as far as home with Will in the afternoon when he went to town. The weather is more moderate and the roads are fine.